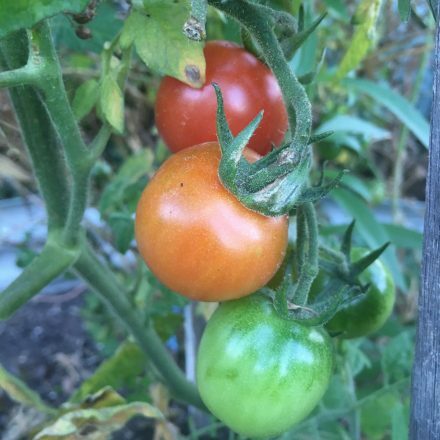 This time of year a gardener’s thoughts turns to tomatoes. When to start them, what types to grow this year and how to do it better than last year! Having just released my first book on this topic with the wonderful Penny Woodward and Janice Sutton, this year I’m growing as many different tomatoes as possible, as I’ve realised my choices have been far too limited. My garden also has a lot of shade from its many fruit trees, so I’m always looking for more places to grow food. One of the places I’ll be growing tomatoes this year is in my newly expanded Vegepod garden on the garage roof. I really liked my first one, so I’ve added another three units. This system has all the benefits of a wicking bed, but is still able to be moved around a little after filling with potting mix, which is handy when we have to go up to work on our bee hive. This lighter weight is also good for the garage roof, keeping the engineer in the family happy! As Vegepods have quite shallow soil depth, the wicking bed aspect of them is essential to be able to grow vegetables like tomatoes that normally like deeper soils, as the roots are able to constantly access good levels of moisture. The other thing I really like in this system is the protective cover, keeping pesky birds at bay. Like many gardeners last summer, I had a lot of budworm caterpillars on my tomatoes, and it’s so disappointing to open up a fruit with only a tiny hole, to find it hollow and black inside. As for tomato types for the Vegepods, I’ll be using Penny’s list from the book, of smaller growing varieties, and keeping taller growing types for other parts of the garden. These smaller types will fit better into the compact space and make my life easier. To support my tomato plants, I’ll use some small free-standing metal cages, as there isn’t the soil depth to drive in stakes. Here’s a small selection from the book. All of these varieties are compact plants.